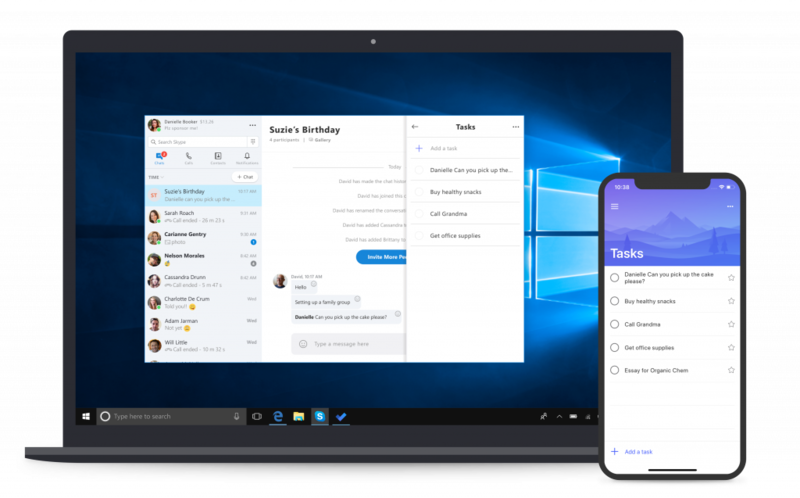 The Windows 10 October 2018 Update is available now, and we’re also releasing new innovations in Office 365, To-Do and Outlook.com. These updates were designed to help you make the most of your time across work, home and everywhere in between. Offering tools for your whole life has never been more important as the lines between work and life have never been more blurred. Whether you are juggling a career and family, running a family as head of household, or growing your career or education, you tell us your greatest need is simply more time and the tools to do what matters most to you. You can get the Windows October 2018 Update in a couple different ways. If you already have a Windows 10 PC and have automatic updates enabled, the update will be delivered to you when it’s ready for your machine. That roll out begins on Oct. 9. If you are an advanced user and would like to get the update sooner, visit this blog post to learn how. Office updates will roll out over the coming months, and more details are below. No need to dig for your phone to text. And you can finally stop emailing yourself photos. With the new Your Phone app you get instant access to your Android phone’s photos and texts on your computer. Snap a pic on your Android phone, see it on your PC. You can also drag and drop photos from your phone onto your PC. And you can copy, edit or ink that photo, right from your PC. Text your friends, group message and type with a keyboard — Your Phone app allows you to view, send and receive the SMS from your Android, on your PC. Android 7.0+ are compatible with Your Phone app, which also helps link iPhones to your PC. For iPhone users, you can surf the web on your phone, then send the webpage instantly to your computer to pick up where you left off. Then you can read, watch or browse with all the benefits of a bigger screen. With a linked phone, continuing on your PC is always just one share away. For quicker access to your phone’s content, pin Your Phone app to your desktop or your taskbar. You can also fire it up through the All Apps list in Start Menu, or by clicking the Windows key and searching for Your Phone app. In April, we introduced you to Timeline on your Windows 10 PC. It aims to end the frustration we’ve all encountered digging through emails and file folders for a document we just can’t find. Timeline makes it way easier to find what matters to you across your devices. You can also pick up what you were doing — even if it was on your iOS or Android device — on your Windows 10 PC when you’re ready to get back to it. Now, your PC’s timeline is available on your phone, so you can scroll back in time to find the files and websites you were using on your phone, computer and tablet. Basically, you can pick up where you left off, wherever you left off. Go back and forth in time by easily scrolling back to find things you were working on earlier today or earlier this week. Share or remove activities whenever you want from a specific day or hour. Available in preview starting today on Android phone via Microsoft Launcher app, coming soon to preview for iPhone. PowerPoint is a powerful tool for visually telling your story, and Word is a canvas for organizing and collaborating on ideas. Whether you’re pitching a concept, teaching a lesson or writing a paper, today we’re making it even easier to showcase your thoughts with new AI-powered inking features and 3D updates that help you find creative flow and design beautiful content. Because some prefer to sketch out their thoughts first, now, you can ink your ideas and we’ll use AI to transform them into perfectly formatted slides. An inked bulleted list will transform into perfectly formatted text. Or, if you’re inking a flow chart or diagram, you can draw both words and shapes, and PowerPoint will easily convert them into text and snapped shapes in one fell swoop. Our AI-powered design engine, PowerPoint Designer, is getting smarter. Designer can now recommend slide designs based on handwritten ink. Or, if typing is more your style, Designer can take a simple block of text, understand the context using AI, and then provide design ideas using icons and Smart Art. To provide even more design options, we’re also adding 350 new icons to our library. To give you even more creative flexibility, we’re also adding over 30 new animated 3D models. If you like the flexibility of editing Word documents using digital pen, we also have some great updates for you. Using <abbr=”Touch capable tablet or PC required. Pen accessory may be sold separately.”>Ink Editor, you can already do things like remove and highlight text. Today, we’ve added new pen gestures that make editing a document from start to finish easier, including adding line breaks, inserting new words as well as splitting and joining words. For the last few years, we’ve been on a mission to transform Office, and use AI to make everyday tasks easier. June, we revealed a fresh, new design for our Office apps and just last month we announced new AI-powered features in Excel and PowerPoint. We’re excited to show you what more there is to come. Most updates to PowerPoint and Word will begin rolling out to Office 365 subscribers on Windows today. The ink to Designer feature will roll out next month. 3D Embedded Animations will roll out to Office Insiders first, and will become generally available in the coming weeks. Text to Smart Art and icons will also be available for PowerPoint Online and Mac. Our task app, To-Do helps you manage, prioritize and complete the most important things you need to achieve each day. To help you keep track of tasks using whatever mode is most comfortable to you, today we’re announcing the ability to update your tasks using ink. With your digital pen and a touch enabled Windows device, simply add a task to your list using ink, and then strike out when complete. By signing in with your Microsoft Account, your tasks are then conveniently synced with the To-Do app across iOS, Android and Windows and the web. Over one year ago, we updated Outlook.com to give our millions of users a faster, smarter and more personalized inbox. Today, we’re making two new updates that make staying on top of tasks easier and interacting with brands you love, better. The new Tasks experience in Outlook.com helps you manage tasks without breaking your flow or leaving your inbox. Powered by To-Do, you can now create tasks by dragging and dropping an email to your task list. Or, easily schedule items by dragging a task to your calendar. Your tasks then travel with you on the To-Do app. Is your inbox overflowing with offers and newsletters from brands? Today, we’re launching a new experience in Outlook.com to help you sort through the noise and interact more easily with the brands you love. Brands now can obtain a verified icon, making it easier for you to identify legitimate businesses in your inbox. And with the new profile card, you quickly have access to contact information, package deliveries, reservations, store locations and more. You’ll also be able to easily see what newsletters you’re enrolled in, and unsubscribe in one click with the new subscription portal. Finally, we are making it easy to find promotions in your inbox by surfacing offer details right in your message list, so you don’t have to open the email to see the deal. 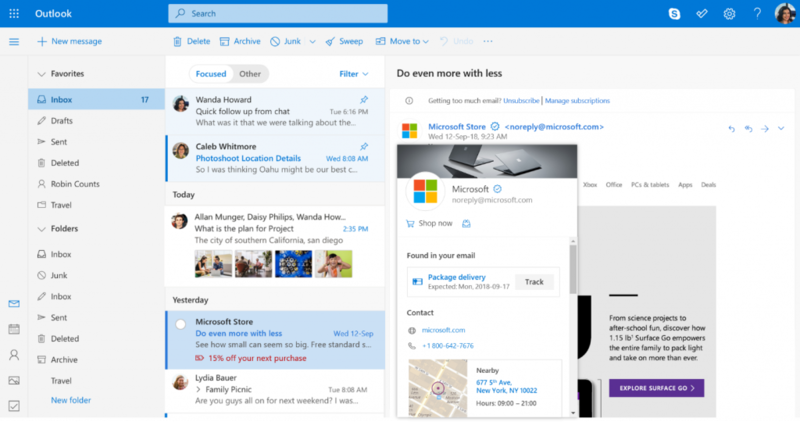 These new features will begin rolling out to Outlook.com customers in the US in the coming months. Snip & Sketch (previously known as Screen Sketch) is now an app. You can now update Snip & Sketch (originally introduced as part of the Windows Ink Workspace under the name “Screen Sketch”) via the Microsoft Store. It will now appear in the list when you press Alt + Tab. You can also set the window size now, and it even supports multiple windows. Easy snipping is just a single step away. We’ve heard that you want to be able to quickly snip and share a screenshot, and we’re making it happen! Pressing the Windows key + Shift + S will now bring up a snipping toolbar – use it to snip a rectangle, something a bit more freeform, or full screen and it will go straight to your clipboard. If that’s all you need, you can take it from there. But say you want more. Immediately after taking a snip, you’ll now get an invitation to take you and your snip to the Snip & Sketch app where you can annotate and share away. Just click the pen tail button. If you have a digital pen, go into Pen & Windows Ink Settings – you’ll find Screen Snipping is now an option for single click. This will launch you directly into our snipping experience below. Press Print Screen. You heard it right, just one button! It’s not enabled by default, so go to Keyboard Settings, where you’ll see a new option that says “Use the Print Screen key to launch screen snipping.” Opening Settings and searching for “print screen” will take you to the right page. Press the quick action button in Action Center, labelled “Screen snip.” It should be there as soon as you upgrade, but if not you can always enable it via Notifications & Actions Settings. 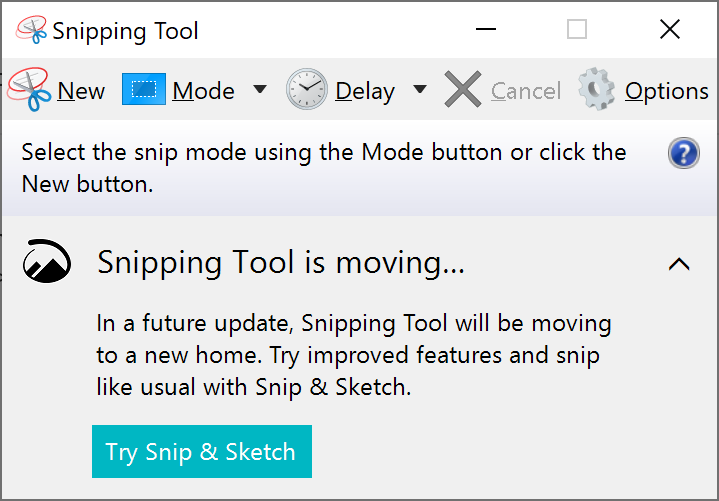 A note about Snipping Tool: As part of the process of consolidating and modernizing our snipping experiences in Windows, when you upgrade to the October 2018 Update you’ll see a note about this in the Snipping Tool. Snipping Tool is still available, and will continue to be available until our data and user feedback indicate people don’t need both experiences. 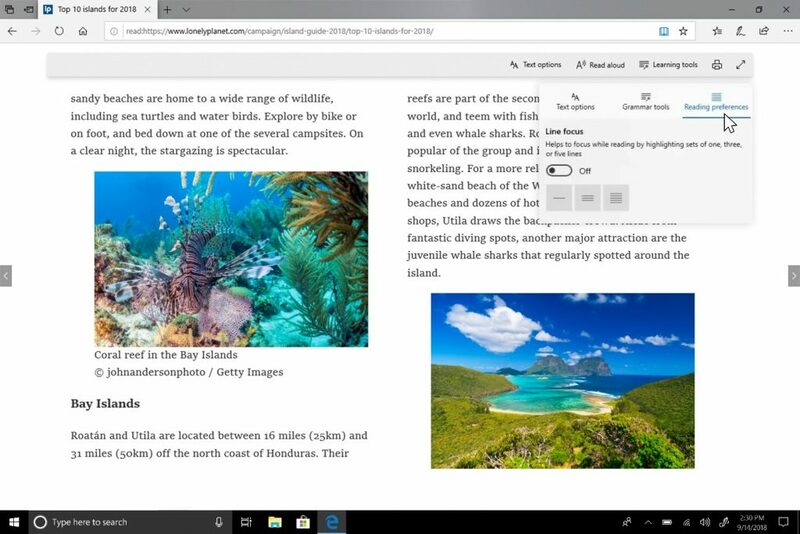 Learning Tools: Microsoft Edge is the only browser with Microsoft Learning Tools built-in that help improve reading and focus. Themes: Select a theme or choose custom colors that work best for you. Grammar Tools: Identify parts of speech with different colors. Line Focus: Like a reading ruler, this feature highlights lines of text, which helps focus your eyes and attention. Offline dictionary. Highlight a word and the definition automatically pops up. Learning tools get richer: Under the learning tools available in Reading View, you can see additional themes. Choose the theme color that’s easiest for you to see. Grammar Tools: Now you can separate words into syllables and highlight parts of speech, such as nouns, verbs and adjectives. Along with highlighting parts of speech, you can now also change the color as well as turn on an indicator right over what you’ve highlighted, making it much easier to identify the part of speech. Line focus: Helps improve focus while reading an article by highlighting sets of one, three or five lines. Once you’ve set your preference, you can easily scroll down the page and the line focus moves as you read. Look up definitions for words in Reading View for web pages, books and PDFs: We’ve added a new dictionary function, so you can look up definitions for key words when reading a page or document, even when you are offline. Simply select a single word to see the definition appear above your selection. Improved toolbar options: The PDF toolbar can now be invoked by just hovering at the top, making the tools more easily accessible. 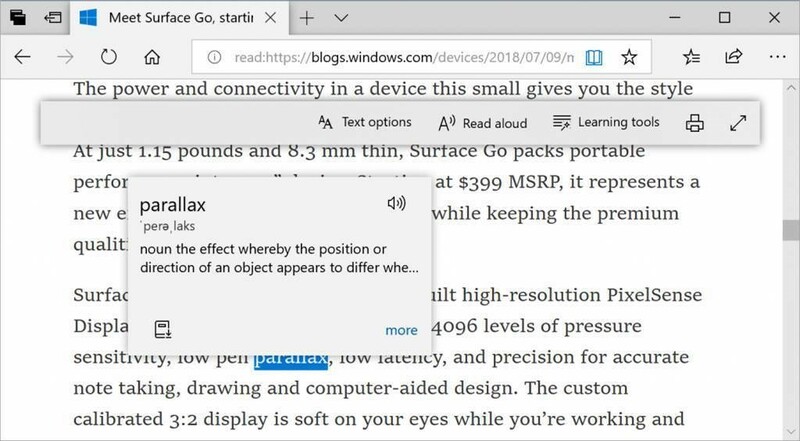 The toolbar, available whenever a PDF document is opened in Microsoft Edge, will now show text descriptions for the icons to make them quickly understandable. New options like “Add notes” make these handy tools available when you need them. Pin/unpin PDF toolbar: The toolbar can now be pinned at the top of the document, making all the PDF tools easily accessible if you need them. You can also unpin the toolbar for an immersive reading experience. If the toolbar is unpinned, it will hide itself – just hover over the top area to bring it back. Rendering improvements: Now you will see less of the white pages when you navigate through PDF files in Microsoft Edge. 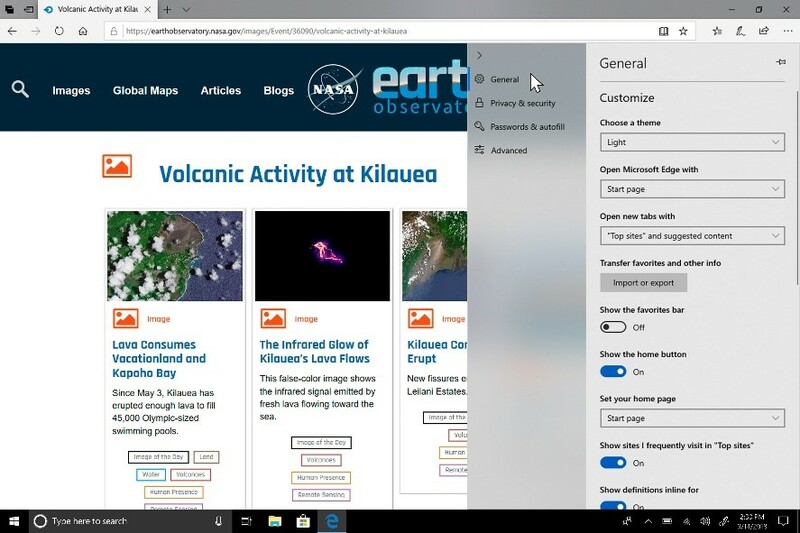 New design improvements: As we continue to evolve how Microsoft Edge leverages the Fluent Design System for a more natural and usable experience, you may notice some subtle tweaks to the look of the tab bar. In the October 2018 Update, we’re adding a new depth effect to help emphasize the active tab. Redesigned “…” menu and Settings: We’ve heard your feedback that the Microsoft Edge settings were getting a little complex for a single page. In this release, we’re making Settings easier to navigate, putting commonly used actions front and center, and providing more ways to customize. The menu options are now organized into groups, with icons for each entry and keyboard shortcuts (where applicable). Click the “…” button in the top-right corner of Microsoft Edge to see what’s new. 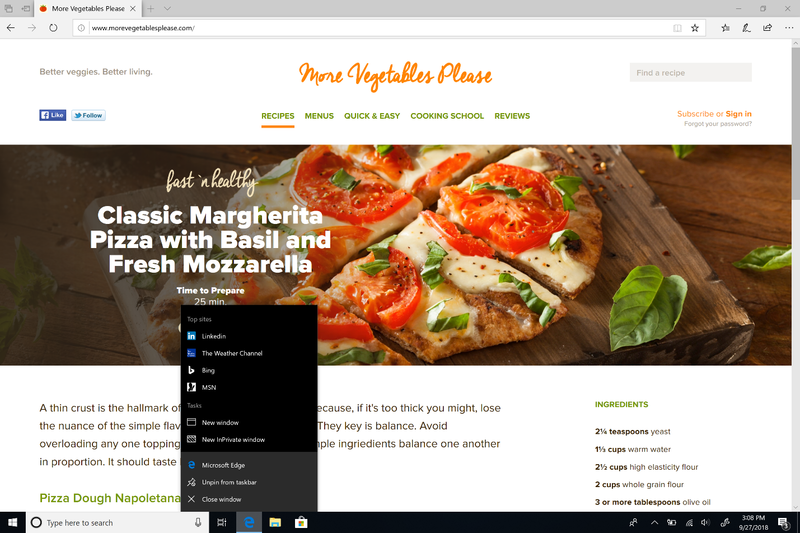 Customize toolbar items for Microsoft Edge: When you click “…” in the toolbar, you’ll find a refined menu that puts common commands like “New window” and “New InPrivate window” front and center. We’ve also added the much-requested ability to customize which icons appear in the Microsoft Edge toolbar – you can remove them all for a tidier look or add as many as you like to bring your favorite functionality to your fingertips. See your top sites in the Jump List: You can now see your top sites in the Jump List on the Windows taskbar or Start menu. Just right-click the Microsoft Edge icon to see a list of your most-visited sites and pin the ones that matter most to you. Right-click on any entry to remove it from the list. Do more from the “Downloads” pane: We’ve added options for “Show in folder” and “Copy link” to the right-click menu for items in the “Downloads” pane. Last (but not least), the October Update breaks Settings out into subpages by category, with better-organized options and less clutter on each page. The new Settings experience is designed to match the Microsoft Edge Favorites, for a quicker and more familiar experience. Web Authentication API: Microsoft Edge now includes unprefixed support for the new Web Authentication API (a.k.a. WebAuthN). Web Authentication provides an open, scalable and interoperable solution to facilitate authentication, which replaces passwords with stronger hardware-bound credentials. 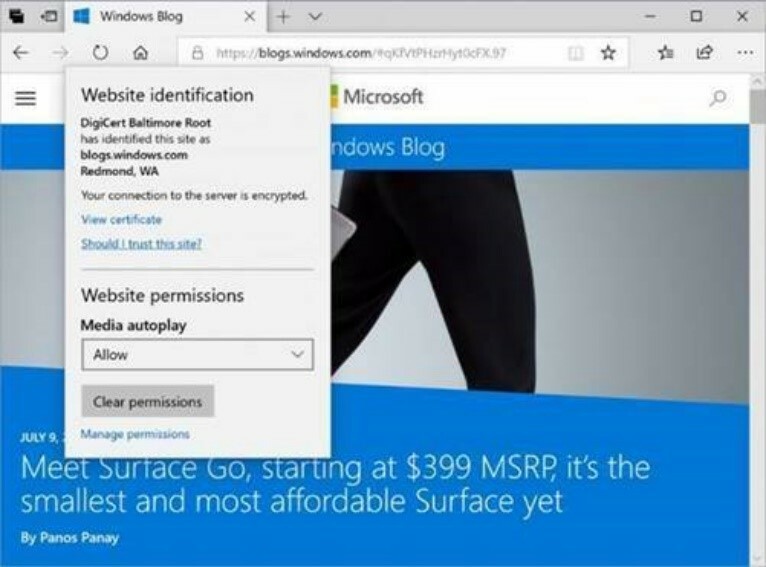 The implementation in Microsoft Edge allows the use of Windows Hello (via PIN or biometrics) and external authenticators, like FIDO2 Security Keys or FIDO U2F Security Keys, to securely authenticate to websites. Microsoft WebDriver is now a Feature on Demand: We’ve made Microsoft WebDriver a Feature on Demand (FoD) so it’s easier to get the right version for your device. You can install WebDriver by turning on Developer Mode, or by going to Settings > Apps > Apps & features > Manage optional features and installing it as a standalone. New Microsoft Edge Group Policies: The Microsoft Edge team has introduced new Group Policies and MDM settings for IT administrators to manage Microsoft Edge. The new policies include enabling/disabling full-screen mode, printing, favorites bar and saving history; prevent certificate error overrides; configuring the Home button and startup options; setting the New Tab page and Home button URL and managing extensions. Learn more about the new Microsoft Edge policies. When “Allow” is selected, sites can play videos when you first browse to the site in an active tab. When “Limit” is elected, sites can only autoplay silent videos, so users are never surprised by sound; once the user clicks anywhere on the page, autoplay is re-enabled for that domain for the duration of that tab. When “Block” is selected, sites cannot autoplay until you interact with the media content. Users can also enable or block autoplay at any time, or change autoplay permissions on a per-site basis, by clicking the information icon or lock icon on the left side of the address bar and selecting “manage permissions” to get started. Retired XSS Filter: We are retiring the XSS filter in Microsoft Edge beginning with the October 2018 Update. Our customers remain protected thanks to modern standards like Content Security Policy, which provide more powerful, performant and secure mechanisms to protect against content injection attacks, with high compatibility across modern browsers. SwiftKey gives you more accurate autocorrections and predictions by learning your writing style – including the words, phrases and emoji that matter to you. It’s available for Android and iOS, and starting with the October 2018 Update, SwiftKey will now power the typing experience on Windows when using the touch keyboard to write in English (United States), English (United Kingdom), French (France), German (Germany), Italian (Italy), Spanish (Spain), Portuguese (Brazil), or Russian. Windows now shows you insights about how its AI has been helping you type with efficiency. If you use the software keyboard on Windows, there are many features built into the typing experience that leverage AI and machine learning to help you be more efficient. Some examples include autocorrecting your spelling mistakes, prediction of the next word you would type, word suggestions as you start typing so you don’t have to type the full word, and displaying the number of words you’ve typed by swiping over the letters on the software keyboard (yes, you can do that, try it out if you haven’t yet). If you have any feedback, please send it via this support form. Copying and pasting is something we all do, multiple times a day. But what do you do if you need to copy the same few things again and again? How do you copy content across your devices? We’re addressing that and taking the clipboard to the next level. Simply press the Windows key + V and you’ll be presented with our brand-new clipboard experience. Not only can you paste from the clipboard history, but you can also pin the items you find yourself using all the time. 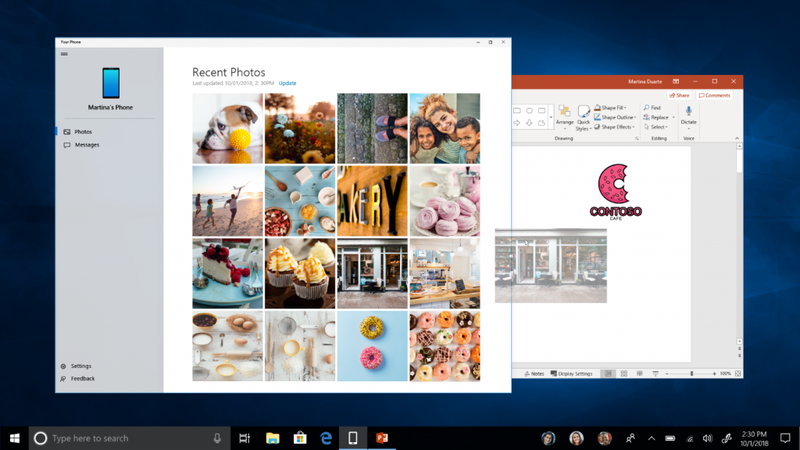 This history is roamed using the same technology that powers Timeline, which means you can access your clipboard across any PC with the October 2018 Update of Windows or higher. Our new settings page for enabling this experience is under Settings > System > Clipboard. Roamed text on the clipboard is only supported for clipboard content less than 100kb. Currently, the clipboard history supports plain text, HTML and image less than 1MB. Unicode 11 comes with 157 new emoji and they’re now available in the October 2018 Update. These include superheroes, redheads, a softball, a pirate flag and a llama. You can get to them using the Emoji Panel (“Windows key + .”) or the touch keyboard. Our ninja cats got a bit of love too – can you spot the difference? If you have any feedback about our emoji and emoji typing experiences, please let us know! We’d love to hear it. The Emoji Panel is currently available for 190+ locales. We’re now adding the ability to name your tile folders. To create a tile folder in Start, just drag one tile on top of another for a second, then release. Continue dropping as many tiles into the folder as you’d like. When you expand the folder, you’ll see a new option to name it. We’ve redesigned the home screen to get you to your content faster. Save time and keystrokes by scanning the ‘Pick up where you left off’ section for your recently accessed items. Focus your search with a filter to quickly find content from your PC and the cloud. Cloud-search enhancements include email from Outlook.com, and documents from OneDrive. We’ve expanded previews to include apps, documents, email, people, and more. Previews save you time and give you the information you need, making it faster to start and finish your task. Get back to what you were doing with fast access to your recent files. Just search for an app to select a file from the Recent list, like a Word doc or Remote Desktop session. Jump-start your tasks with quick actions in previews. Create an Outlook meeting, send an IM, run PowerShell as Administrator, open a file’s location, and much more. Easily distinguish between files with details including location, last modified date, and author all shown in the preview. Get web search results like quick answers, news, and websites, without opening a browser. To find image and video results for a web search, select an option at the top of the preview. We’ll be updating and improving the Search experience over time as we develop and add features. Stay tuned! Search is now available in the Calendar app for Windows 10! Now you can find past or future events by searching for the name, location, people included or words in the event body. Events that match your search will be clearly visible on your calendar, while those that don’t will be dimmed so you can find what you need quickly. Search works for Outlook.com and Office 365 accounts. How many times have you been immersed in a captivating virtual experience and wanted to take a quick glance at your friend in the same room; or reach for a drink, your phone or a keyboard; or needed to find a surface to set down your controllers? You’ve probably fumbled about as you were removing your headset, which can be really fun if you have controllers in your hands. But now that awkwardness may become a thing of the past, as you can now peer into your physical environment through Flashlight – without removing your headset! With the October 2018 Update, you can open a portal into your real world at any time via the Start menu, a button shortcut or a voice command. . This opens a low-latency pass-through camera feed connected to your controller. It’s comfortable, intuitive and keeps you immersed. Flashlight finally allows you to mix your physical and virtual realities. While using an Immersive Application, you can easily Go Home, view the time or launch Mixed Reality Capture tools (Photo, Video and more) with Quick Actions. To launch Immersive Application Quick Actions, simply press the Windows key. 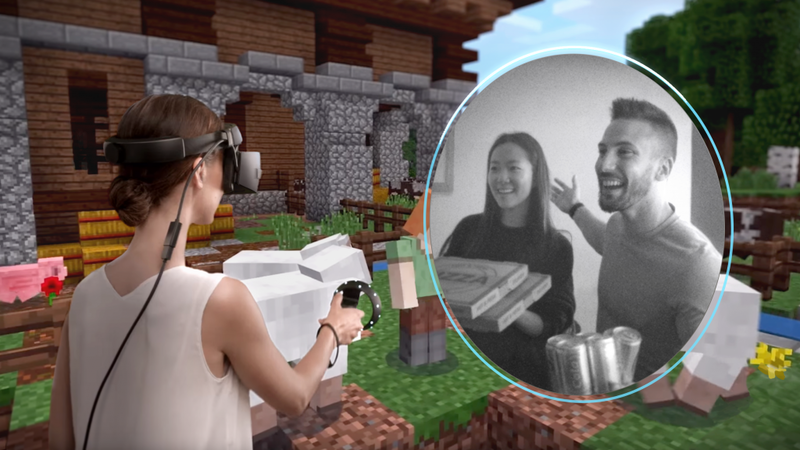 Now you can hear sound from your normal PC speakers when not running the Mixed Reality Portal (MRP) and from the headset’s audio jack or built-in headphones when mixed reality is running. Close all apps, including MRP, and go to Settings > Mixed reality > Audio and speech to turn on “When Mixed Reality Portal is running, mirror headset audio to desktop.” You will now hear audio from both the headset and PC speakers when running mixed reality. With the October 2018 Update, Windows no longer requires a physical monitor to be connected while running Mixed Reality in cases such as backpack PCs. Setting up WMR for the first time in Mixed Reality Portal and unlocking the PC on the sign-in screen still requires a monitor to be connected initially. However, you can configure auto login to prevent needing to sign in for subsequent usage. Remember to set up a room boundary if you’re using Windows Mixed Reality while standing. We’ve also made some adjustments to the mixed reality video capture experience in the October 2018 Update to make it easier to stop videos from the Start menu. New look: Enjoy a cleaner new look and layout. New audio controls: With the new audio control panel, get more control out of individual audio channels without ever having to leave your game. Game bar is now an app: Launching Game bar is now easier than ever, whether through the desktop, apps, the Start menu, or task bar. Fewer gaming interruptions: Based on feedback from gamers, we’ve simplified the way Game Mode works. Now auto-enabled for all games with a master On/Off toggle in Windows Settings, Game Mode suppresses Windows Update driver installs and blocks Windows Update interruptions such as restart notifications while you’re gaming. You may also see improved game performance with less FPS variability depending on the specific game and system. This new Skype for Windows 10 update brings all the latest and greatest Skype capabilities to Windows 10 users. Customers will enjoy the same consistent experience across all devices and platforms – iOS, Android, Mac and Windows. Exclusive to Windows 10, you can now use the Share Charm to quickly share content directly with your Skype contacts. 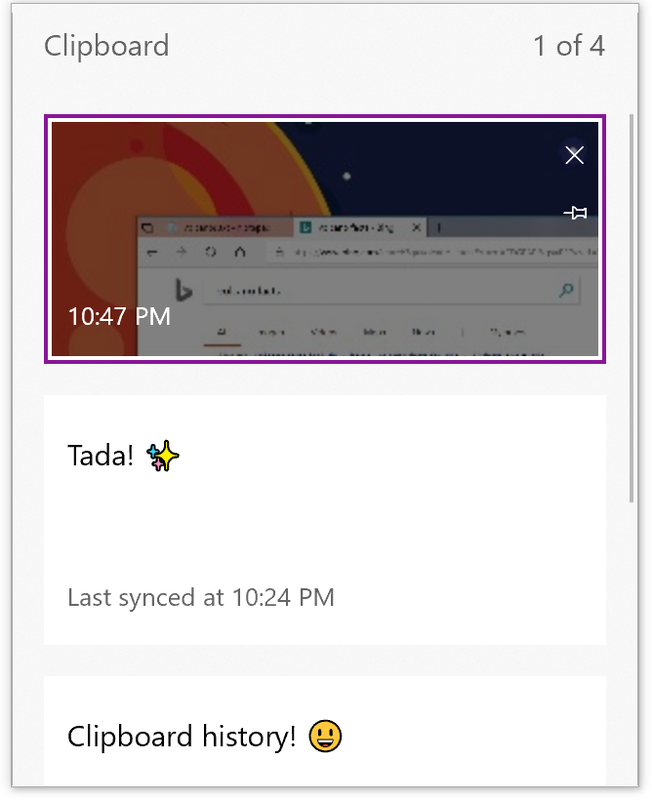 If you’re browsing in Microsoft Edge or looking for a document in File Explorer and find something you want to share, just tap the Share icon and select a Skype contact to share with – there’s no need to launch Skype. Call recording — With call recording, you can save a call to the chat and return to it later, so you won’t forget something important. Missed a meeting? No problem, now you can find and replay key moments or decisions, just as they were made by those on the call. Private Conversations — Have end-to-end encrypted Skype audio calls, send text messages, image, audio and video files. The content is hidden in chat list notifications to keep the information you share private. Themes — You can now customize your chat bubbles. Give them color to make your chats more festive or stick with our classic colors when you need to get down to business. And much more — Archive conversations, ability to mute others in a group call, @mentions and more. If you’ve chosen to have updates installed automatically on your Windows 10 device, you don’t have to do anything — these new features will be available to you automatically through Microsoft Store updates. As always, please join us in the Skype Community and send us your feedback by opening your settings and selecting Help & Feedback. Microsoft Forms is a simple, lightweight tool for creating surveys and quizzes. Millions of people have used Forms since we released it for education and commercial organizations. Today, we’re extending the Forms Public Preview to consumers as well. With Forms, you can easily create, run and analyze results from surveys and quizzes. Simply share a link or QR code, and your friends and family can access your form from virtually anywhere, on any device and at any time. With real-time responses and automatically generated charts, Forms makes it easy for creators to quickly understand the results and take the right next step. To get started, you can sign in using a free Microsoft Account here. With the Microsoft Font Maker app you can use your digital pen to create a custom font based on the nuances of your own handwriting – currently available via the Microsoft Store and we’d love to hear your feedback! Install the fonts you create to add a personal touch to everything you do. Currently you can use the app to create a basic English font. With the October 2018 Update, Azure Active Directory and Active Directory users using Windows Hello for Business can use biometrics to authenticate to a remote desktop session. This feature works with Windows Hello PIN, however it does not work with convenience PIN. To get started, bring up Remote Desktop Connection (mstsc.exe), type the name of the computer to which you want to connect and click Connect. 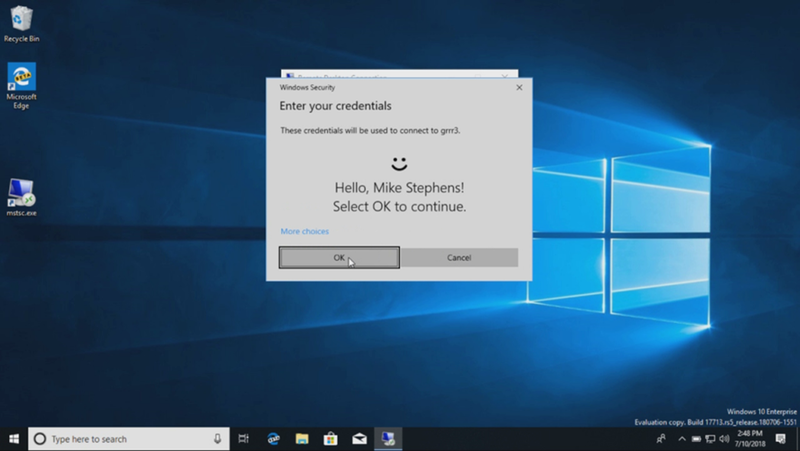 Because you signed using Windows Hello for Business, Windows remembers how you signed in and automatically selects Windows Hello for Business to authenticate you to your RDP session, but you can click More choices to choose alternate credentials. 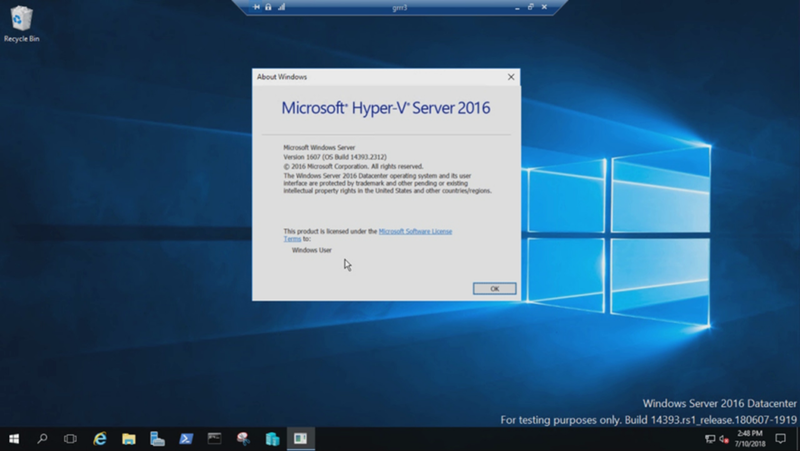 In this example, Windows uses facial recognition to authenticate the RDP session to the Windows Server 2016 Hyper-V server. You can continue to use Windows Hello for Business in the remote session, but you must use your PIN. Have feedback? We’d love to hear it! Head to the Feedback Hub to share your thoughts about Windows Hello with face, fingerprint or PIN. Until now, Windows logon only supported the use of identities federated to ADFS or other providers that support the WS-Fed protocol. 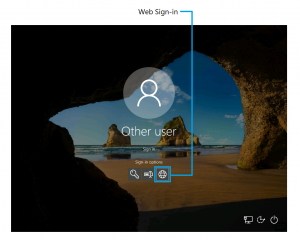 We are introducing “Web Sign-in,” a new way of signing into your Windows PC. Web Sign-in enables Windows logon support for non-ADFS federated providers (e.g. SAML). Azure AD Join your Windows 10 PC. (Note: Web Sign-in is only supported on Azure AD Joined PCs). Set the following policy to enable Web Sign-in (Policy CSP/Authentication/EnableWebSignIn). Click on the “Sign in” button to continue. Do you have shared PCs deployed in your work place? Do you wish that signing in to a PC with your account was faster? Starting with the October 2018 Update, we are introducing “Fast Sign-in,” which enables users to sign in to a shared Windows 10 PC in a flash. Set up a shared or guest PC with Windows 10. Set the following policy to enable Fast Sign-in (Policy CSP/Authentication/EnableFastFirstSignIn). With the policy enabled, sign-in to a shared PC with your account, and check out the difference. You can still get to the app in all the usual ways – simply ask Cortana to open Windows Security or interact with the taskbar icon. Windows Security lets you manage all your security needs, including Windows Defender Antivirus and Windows Defender Firewall. More easily understand current threats: We’ve listened to feedback and continued to improve the Virus & threat protection section. We’ve changed the location of the Current threats area, which displays all threats that need action. You can quickly take action on threats straight from this screen. Controlled folder access improvements: Controlled folder access can help prevent ransomware and other destructive malware from changing your personal files. Sometimes apps that you normally use might be blocked from making changes to common folders like Documents and Pictures, and we’ve listened to feedback and made it easier for you to allow apps that were recently blocked so you can stay productive while using this great feature. To allow a recently blocked app to make changes to your protected folders, open the Virus & threat protection section, then click Ransomware protection, and Allow an app through Controlled folder access. From there you can click the plus button to allow an app, and you’ll see the new option to add Recently blocked apps. This will open a list where you can easily choose which blocked items you’d like to trust to make changes. Alternately you can still browse for an app to allow. A more complete view of your security: We’re continuing to work on how other security apps you’ve installed show up in the Windows Security app. There’s a new page called Security providers that you can find in the Settings section of the app. Click Manage providers to see a list of all the security providers (including antivirus, firewall and web protection) that are running on your device. Here you can easily open the providers’ apps, or get more information on how to resolve any issue that they have reported to you through the Windows Security app. This also means you’ll see more links to other security apps within the Windows Security app. For example, if you open the Firewall & network protection section, you’ll see the firewall apps that are running on your device under each firewall type (domain, private and public networks). New device health assessment: In the Device performance & health section, we’ve added a new assessment for the Windows time service. If we detect that your device’s time is not properly synced with our time servers and the time-syncing service is disabled, we’ll provide the option for you to turn it back on. We’ve heard your feedback, and when you install the October 2018 Update you’ll find we’ve updated Windows Security to include the Fluent Design elements you know and love. You’ll also notice we’ve adjusted the spacing and padding around the app and will now dynamically size the categories on the main page if more room is needed for extra info. Last but not least, we’ve also updated the title bar of the app so that it will now use your accent color if you’ve enabled that option in Color Settings. You can add specific rules for a WSL process in Windows Defender Firewall, just as you would for any Windows process. Also, Windows Defender Firewall now supports notifications for WSL processes. For example, when a Linux tool wants to allow access to a port from the outside (like SSH or a web server like nginx), the Windows Defender Firewall will prompt to allow access just like it would for a Windows process when the port starts accepting connections. The Windows Security Center (WSC) service now requires antivirus products to run as a protected process to register. 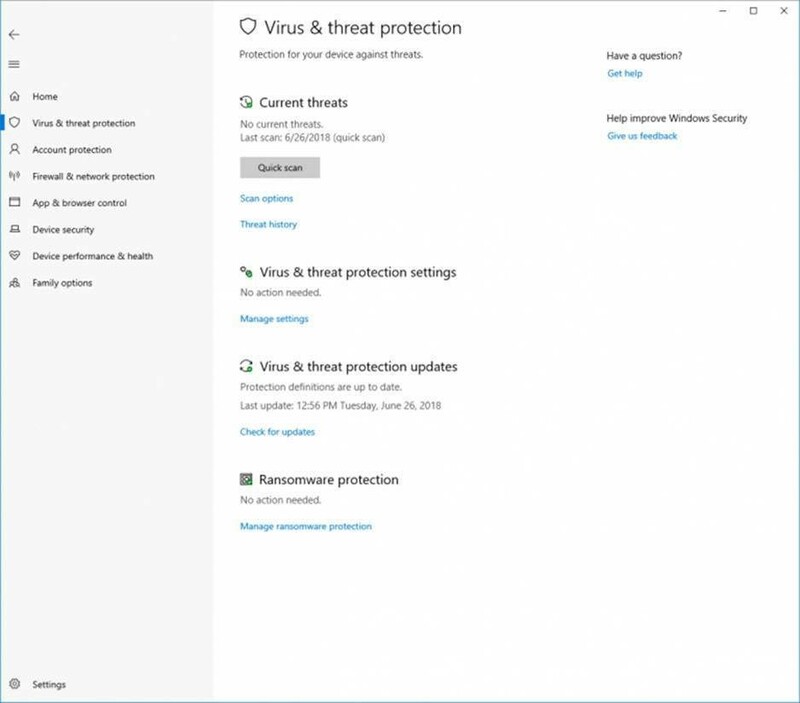 Products that have not yet implemented this will not appear in the Windows Security UI, and Windows Defender Antivirus will remain enabled side-by-side with these products. Windows Defender Application Guard introduced a new user interface inside Windows Security in the October 2018 Update. Standalone users can now install and configure their Windows Defender Application Guard settings in Windows Security without needing to change Registry key or Group policy settings. Additionally, users who are managed by enterprise policies will be able to check their settings to see what their administrators have configured for their machines to better understand the behavior of Windows Defender Application Guard. This new UI aims to improve the overall experience for users to manage and check their Windows Defender Application Guard settings. As long as devices meet the minimum requirements, these settings will appear in Windows Security. To check this out, go to Windows Security and select App & browser control. 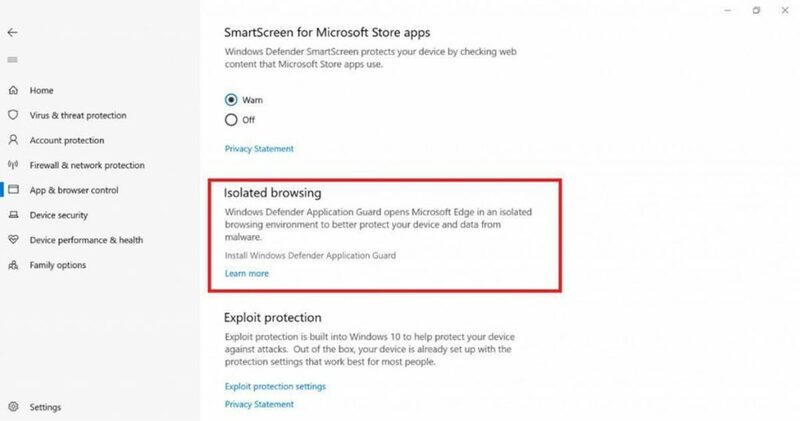 Under Isolated browsing select Install Windows Defender Application Guard. After installation restart the device (only for standalone users). 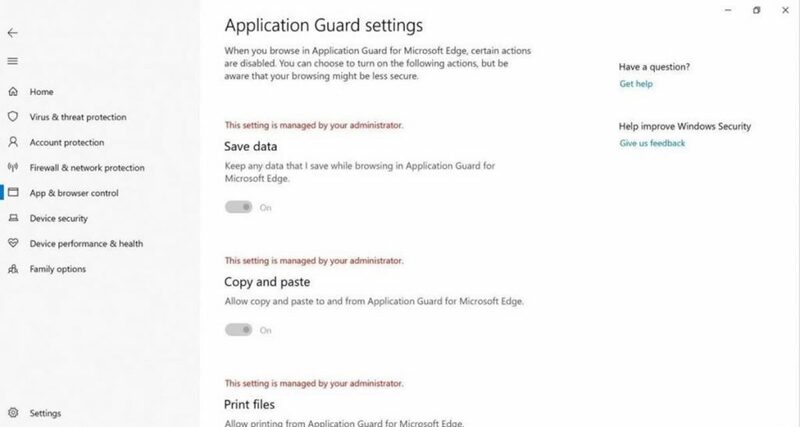 To view or change Application Guard settings select Change Application Guard settings. 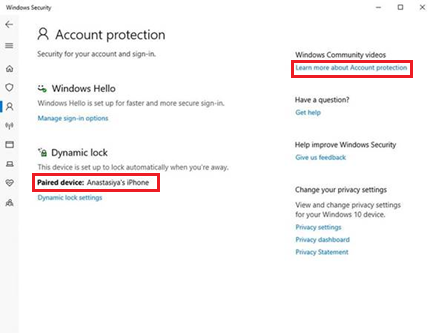 In October 2018 Update, the Account Protection section in Windows Security Center now identifies the paired device that is being monitored for Dynamic lock. In cases where you have multiple devices paired to the PC, this UI indicator will help you easily determine which device is being monitored to lock your PC if you walk away. You can access Ease of Access settings by going to Settings > Ease of Access. 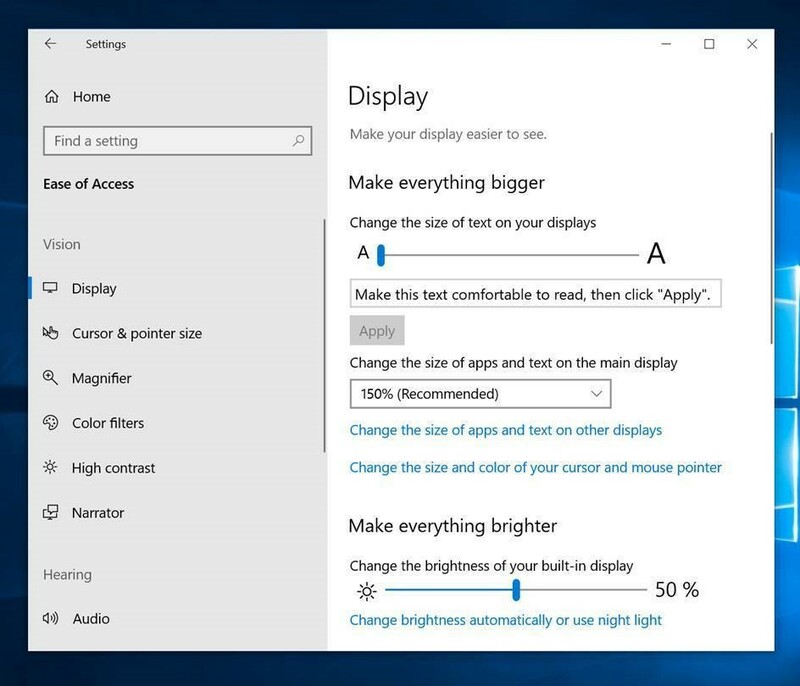 Now, when you go to Settings > Ease of Access > Display in the October 2018 Update, you’ll find a new setting called “Make everything bigger.” This slider will adjust text across the system, Win32 apps and Universal Windows Platform apps. That means you can now make text bigger in the Start menu, File Explorer, Settings, etc., without having to change the overall scaling of your system. 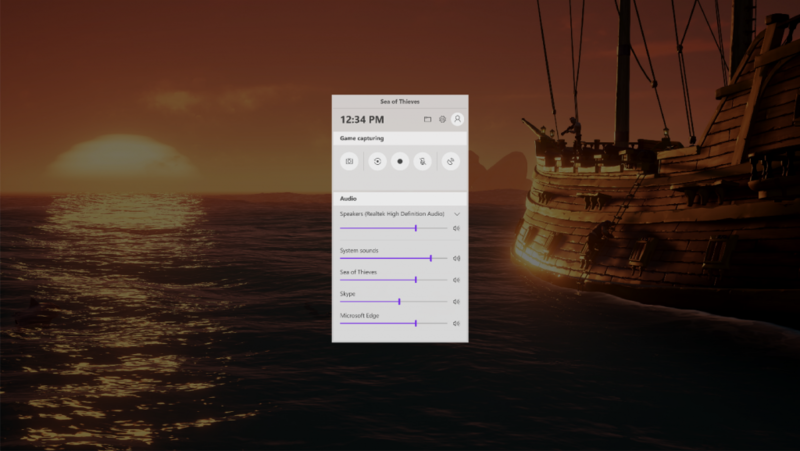 Choose where to keep the mouse cursor: We’ve heard your feedback asking us for a way to keep your mouse centered on the screen in Full-Screen mode, and with the October 2018 Update, we’re making it happen. This new option under Settings > Ease of Access > Magnifier > “Keep your mouse…” > “centered on the screen” enables easier tracking and use of the mouse, especially helpful at higher magnification levels. More options for increments: You’ve also been asking for even more control of your zoom level increments, so we’ve taken a moment to add two new increments to the list: 5 percent and 10 percent. Selection commands in Narrator Scan Mode: Narrator’s scan mode now supports selecting content in Microsoft Edge, Word, Outlook, Mail and most text surfaces. Standard Shift- selection commands can be used as well as Control + A for the entire document. Caps + Shift + Down Arrow will speak the current selection. For a full list of selection commands, you can refer to Narrator’s Show Commands List by pressing Caps + F1. Once you select content, copy it to the clipboard by pressing Control + C. Formatting information will also be retained. Narrator Standard Keyboard Layout: Narrator now ships with a new keyboard layout that is designed to be more familiar to screen reader users. For details on these changes, check out Intro to New Narrator Keyboard Layout. Check out great Windows 10 devices, and discover what the October 2018 Update has to offer with free demos and workshops at your local Microsoft Store or online. Get a free consultation from expert Service Advisors to determine if your device is eligible for the update, or get assistance setting up a new device.